Fresh flavours of garlic and ginger mean this lighter style soup is still full of flavor. Heat oil in a large saucepan and gently cook garlic and ginger until aromatic. Add water and CONTINENTAL Professional Gluten Free Chicken Noodle Soup Mix and bring to the boil, stirring continuously. Reduce heat, add chicken, bok choy and simmer for 10 minutes. 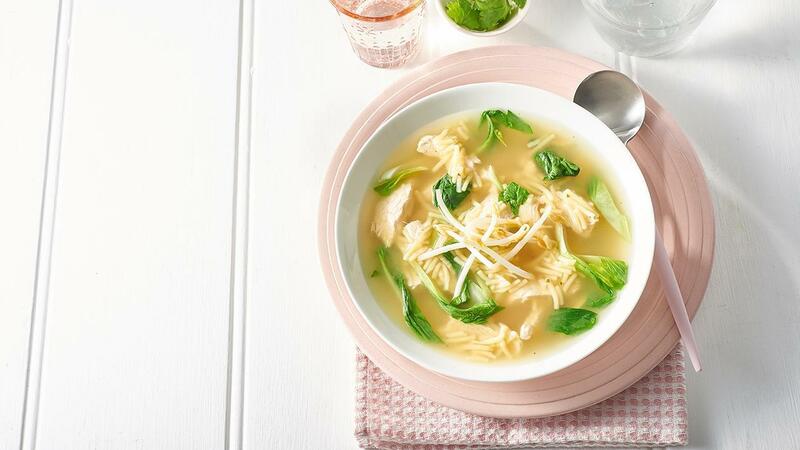 Serve chicken noodle soup garnished with bean shoots. Serve with fresh lemon or lime wedges. Add extra (vermicelli) gluten free noodles for additional calories and garnish with coriander.